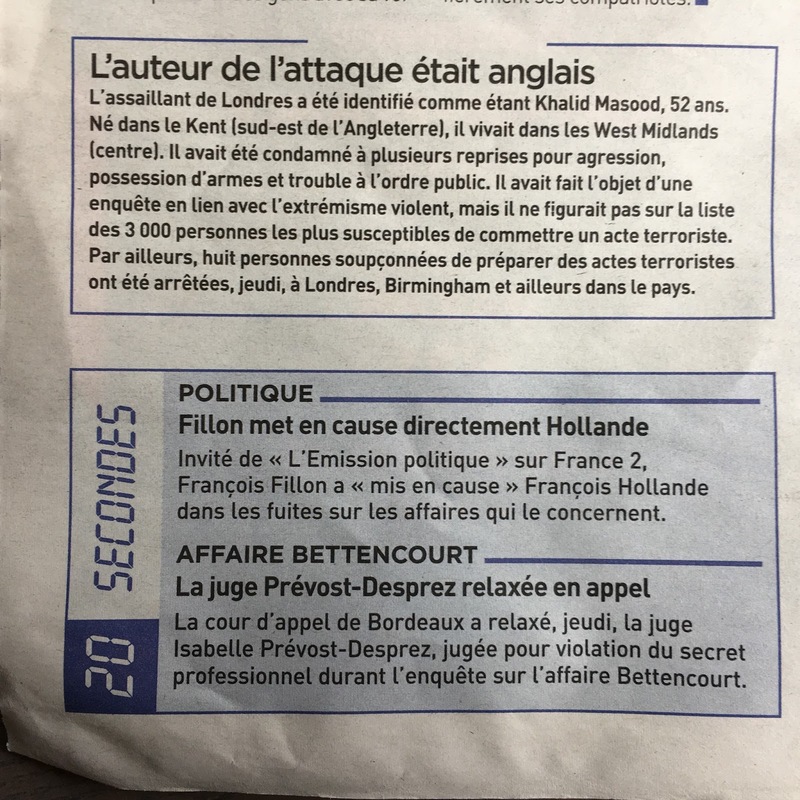 Est-ce l'Amérique peut se déTrumper ? 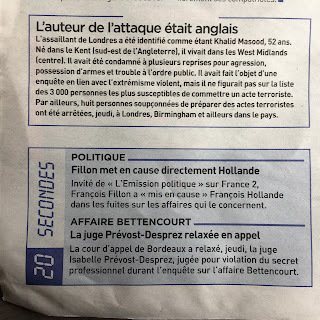 asks French radio in a play on words meaning both Can America unTrump itself and Can America undo its blunder. 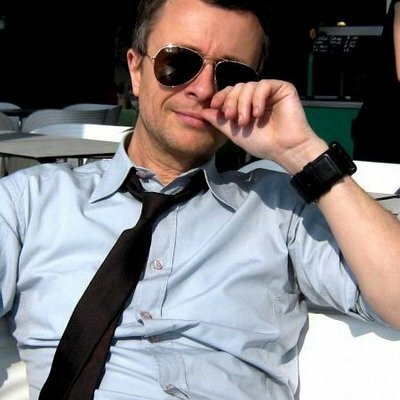 Among the guests of Laurent Goumarre's Le Nouveau Rendez-Vous on the France Inter radio channel devoted to the question whether Donald Trump can be impeached — or, rather, removed from office (a number of people seem to think that they are one and the same) — were Jean-Xavier de Lestrade, Samuel Doux (scénariste, réalisateur et auteur), Kid Francescoli (Chanteur), Norman Spinrad (auteur de science-fiction américain), Constance Borde (Représentante en France du parti démocrate), and Eric Fottorino (Journaliste et écrivain), as well as, last but not least, Paul Reen (représentant du Parti Républicain en France). Notably, Alice Antheaume spent three and a half minutes in a mocking monologue over Donald Trump's tendency for writing tweets. 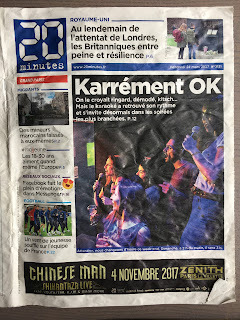 After Christop Bourseiller went on and on for two and a half minutes with an editorial on the possibility of Donald Trump's impeachment and removal for office, Paul Reen answered with a single monosyllable. 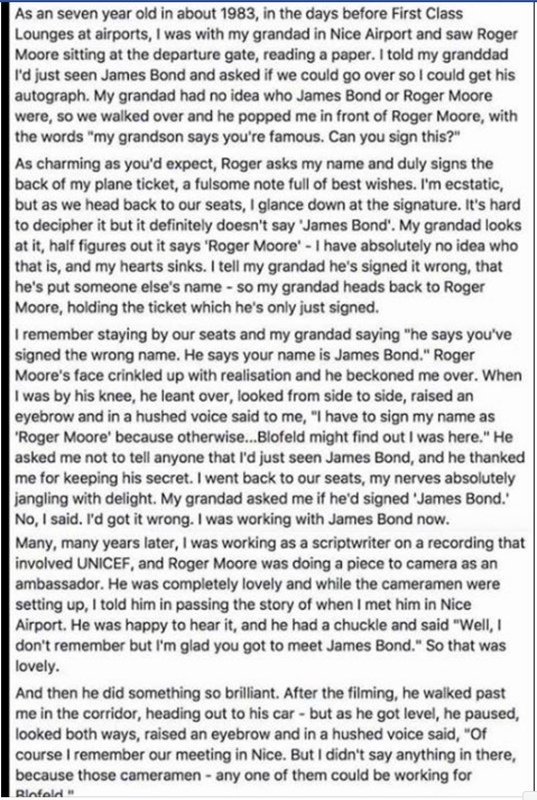 A 7-Year-Old Spots a Celebrity in an Airport, His Heart Sinking When Roger Moore's Autograph Does Not Read "James Bond"; What Happens Next? In the wake of the passing of Sir Roger Moore, one Mark Williamson posts the following reminiscence (is it his own or someone other's?) on Facebook (cheers to Michael White). HE WAS MY FIRST CRUSH WHEN I SAW HIM IN THE PERSUADERS. I WAS TEN. 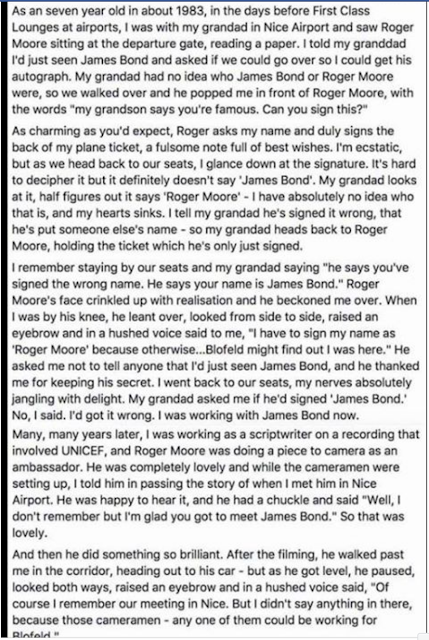 Here is Roger Moore’s own story, as told by the famous actor himself. This profile also includes the recollections of colleagues and friends like Gregory Peck, Michael Caine, Tony Curtis, Carroll Baker and Maud Adams. When Sean Connery played James Bond, he played it as the bad boy womanizer. And when Roger Moore played Bond, he played it as the man that — maybe — would marry the heroine …if the circumstances were right. Meanwhile, Adrien Guilleminot has a long interesting commentary (en français) on the James Bond films in the Géo monthly. Women have played a big part in my life on and off-screen and I think I’ve finally worked them out. I always make sure I have the last word. That word is ‘yes’. ‘It just gave me a stiff neck’ — explaining why taking Viagra left him neither shaken nor stirred. Intelligence is my most endearing quality, according to [his wife] Kristina. That’s her Swedish sense of humour. Being eternally known as Bond has no downside. People call me Mr Bond when we’re out and I don’t mind a bit. Why would I? ‘I had creaking knees and my leading ladies could have been my granddaughters’ — on his last appearance as James Bond in A View To A Kill, aged 57. ‘I lie all the time. I say different people, otherwise you’ll upset somebody’ — on his favourite Bond girl. I’m one lucky b******. In my early acting years, I was told that to succeed you needed personality, talent and luck in equal measure. I contest that. For me it’s been 99 per cent luck. It’s no good being talented and not being in the right place at the right time. The saddest thing about ageing is that most of my friends are now ‘in the other room’. I miss David Niven the most. I still can’t watch his films without shedding a tear. I still have some of Bond’s suits in my wardrobe, but they don’t fit me now. In the 007 days I was so thin that if I turned sideways you could mark me absent. My mum instilled in me the proverb: ‘I cried because I had no shoes, until I saw a man who had no feet.’ Those words are always with me and I’m a believer in showing kindness to others and not expecting repayment. Medicine has always fascinated me and I’m a hypochondriac. It’s not that I wake up every morning and think: ‘I’m dying.’ At my age, I know I am.